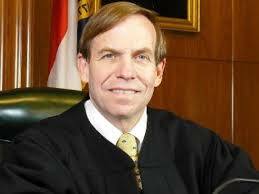 WataugaWatch: NC Supreme Court: "Extortion of Public Employees Is Fine With Us!" NC Supreme Court: "Extortion of Public Employees Is Fine With Us!" The North Carolina Supreme Court on Friday issued a ruling that any county sheriff can demand a political donation from deputies and fire those deputies if they fail to pony up. No kidding! The court declared that "deputies work directly for the sheriff and do not have the same protections as county government workers when it comes to political activity." Deputies (and sheriffs, for that matter) also work for the citizens in their jurisdiction, who might also want to believe that law enforcement is not about who's swinging the biggest political stick. The sheriff in this particular case, incidentally, was a Democrat. Power fiefdoms, especially ones that feature the extortion of money from employees, are abhorrent to my notions of democracy. The only sitting justice up for election in 2016 is Bob Edmunds, but the Republicans have made it impossible to vote for someone else. By the rules of the new "retention elections" for Supreme Court justices, we can only vote to "retain" Edmunds, or not retain him. We will have no choice to vote for someone else ... unless a constitutional challenge to "retention elections" gets heard favorably by a special three-judge panel. I will not be voting to "retain" Justice Edmunds. I can barely retain my breakfast, thinking about this particular ruling. This is a true and relevant post. The NC Sheriff's Association is far too powerful. Most of the Rethuglican politicians in the State Legislature side with the NC Sheriff's Association over the people EVERY SINGLE TIME. It's unconstitutional for the Sheriff's to require ANYTHING of a deputy, especially a campaign contribution. The NC Sheriff's Assocition has much power over Democrat and Republican politicians which is a good reason why Bernie Sanders and Donald Trump are becoming popular - they don't pander to anything other than what they believe in. It also goes without mentioning that conservatives in NC disagree with the liberal Republican legislature's constant siding with corrupt Sheriffs over the right to keep and bear arms. The same Sheriffs that require deputies to give campaign contributions also don't believe you have the right to life, liberty and the pursuit of happiness.